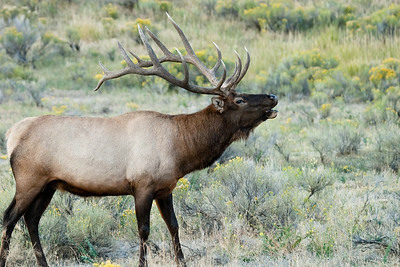 A bull elk in Yellowstone bugles at the start of the rut near Mammoth Hot Springs. 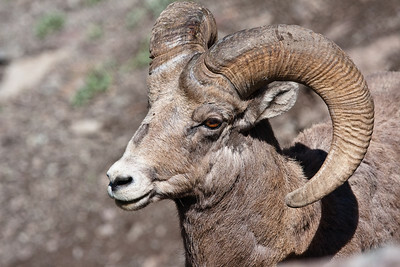 This Bighorn Ram was found near Sylvan Pass in Yellowstone, NP. Not a full curled Bighorn Ram, but still a handsome boy. 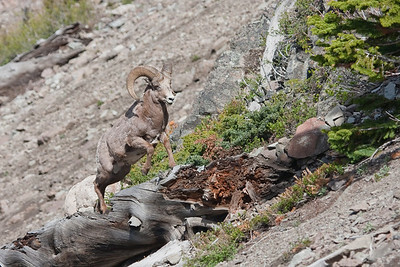 This ram was near Sylvan Pass in Yellowstone, NP. 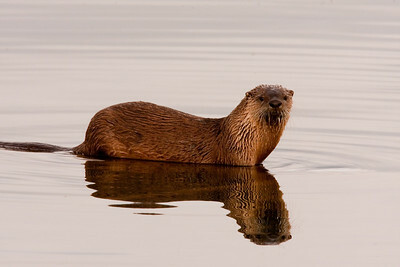 This is an American River Otter that is perched on a submerged log in Lake Yellowstone. 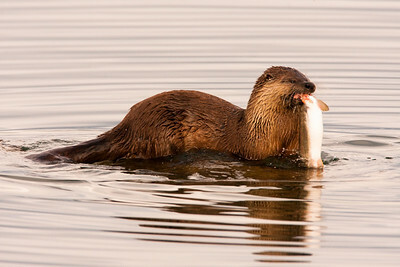 A morning snack of either a Lake Trout or a Cutthroat Trout for this otter. The otter was perched on a log in Lake Yellowstone near Mary's Bay. 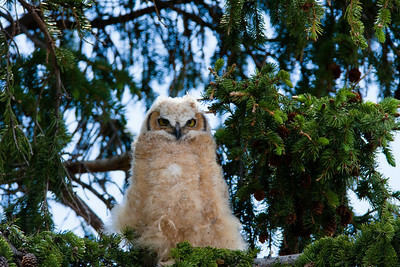 A Great Horned Owlet just before fledging. 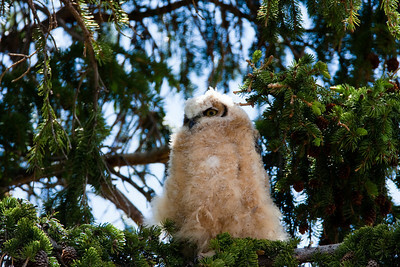 This owlet is about 2 months old and days from flight. Mother was sleeping nearby in a building. The past two years, this young ones parents have been nesting near the visitors center in Mammonth Hot Springs. 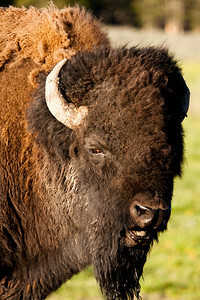 The buffalo of the American West was once plentiful and brought back from the brink of extinction through the conservation efforts at the turn of the century. 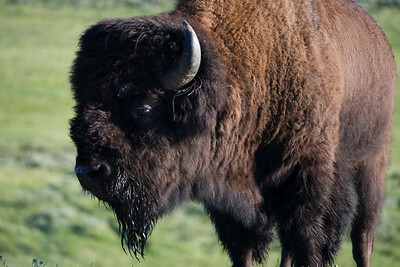 Yellowstone NP now houses the largest free roaming herd of buffalo (also more correctly known as bison) in North America. It is now seen as an icon of the American West. 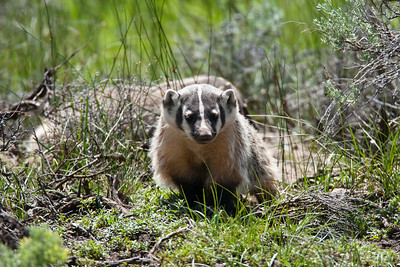 A young badger stands watch outside of its den while mom is out hunting for food. This den was located in the Lamar Valley in Yellowstone, NP. The Lamar is often refered to as the Serengeti of North America because of the large abundance of wildlife. The mega fauna of Bison, Elk, Pronghorn, Grizzly Bear, Black Bear, Grey Wolf, and Coyote inhabit this area with their small friends. 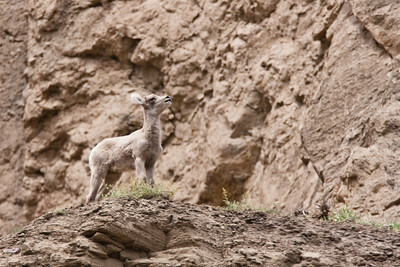 A young bighorn sheep surveys its domain just north of Mammoth Hot Springs. In actuality, this is a normal behavioral event of all bighorns. They will stand on a cliff like this and expose their chests to the updraft coming up the cliff to help cool themselves off during the summer months. 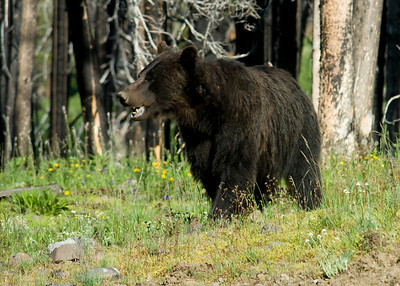 This Grizzly bear is pestered by the mosquitos on the flanks of Mount Washburn. 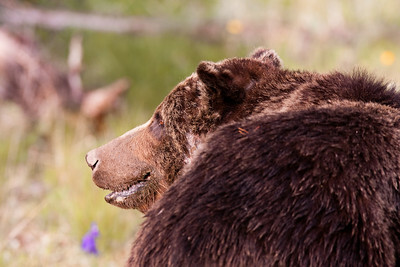 This bear is known as Scarface because both sides of his face have been blemished in fights over the years. This gentle looking bear is out grazing and looking for bugs and grubs. He is known as Scarface and appears to be quite the fighter. It is estimated that he is 18 years old and weighs about 600lbs in this photo from early July. 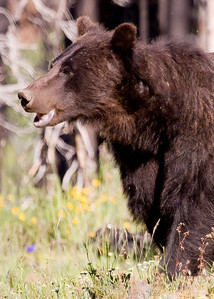 He will pack on the weight over the next two months getting ready for winter on Mount Washburn in Yellowstone. 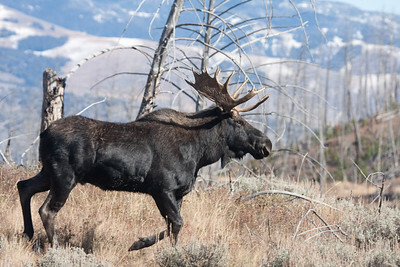 A nice bull moose on the run new the Petrified Tree near Roosevelt Lodge in Yellowstone National Park. Am I a black bear? No I am a grizzly. 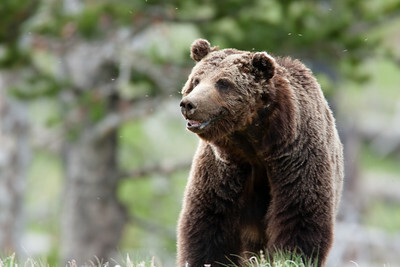 Not all grizzlies have the silver tipped fur, and it can even change from year to year. This is likely a sub adult with a black color phase. He was busy eating roots near the Lake Butte Overlook in Yellowstone. 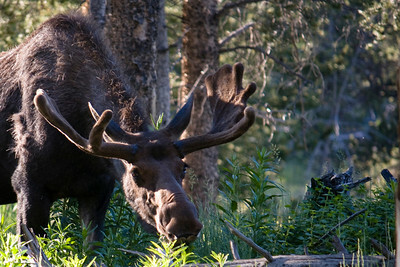 This moose was photographed in the Antelope Creek drainage on the north side of Mt. Washburn in Yellowstone. The photo was taken during the summer while the antlers were still growing. This is evidenced by the soft, fuzzy appearance of the antlers, which is known as velvet. 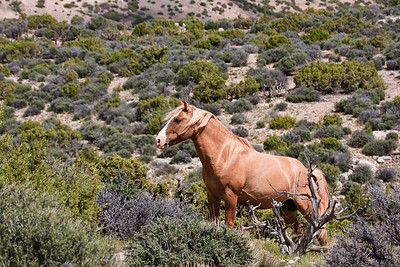 Yellow Stud: This is the lead stallion of a band of mustangs in Bighorn Canyon NRA and part of the Pryor Mountain Wild Horse Range. This photo was chosen as part of the 2011 Cowboys and Indians Magazine Photocontest. It can be seen in the March 2011 edition. 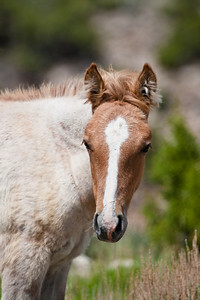 A young mustang colt grazes in Bighorn Canyon NRA. 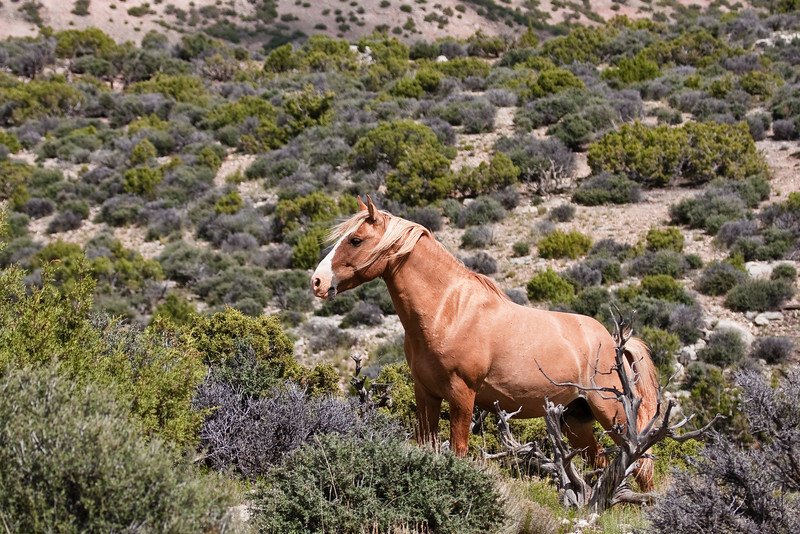 He will one day take over his own group in the Pryor Mountain Wild Horse Range in North Central Wyoming and South Central Montana. 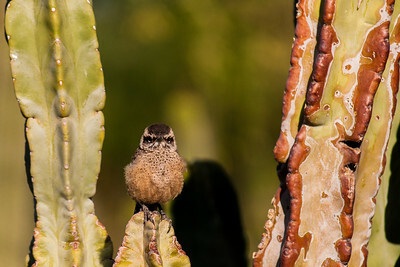 This is a juvenile cactus wren, the state bird of Arizona. The image was taken at the Desert Botanical Garden in Phoenix, AZ. 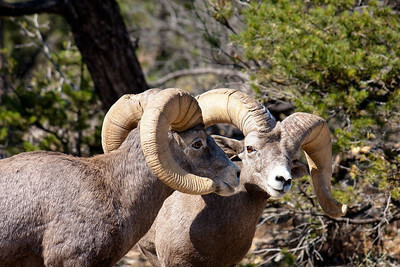 This is a pair of desert bighorn sheep. 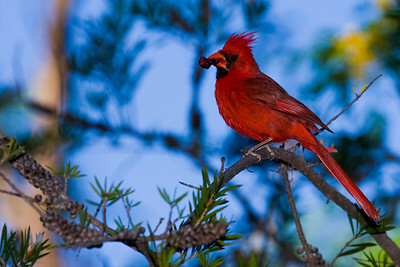 The image was taken on the South Rim of the Grand Canyon near the El Tovar Hotel. These rams are sizing one another up near the end of the rut season. 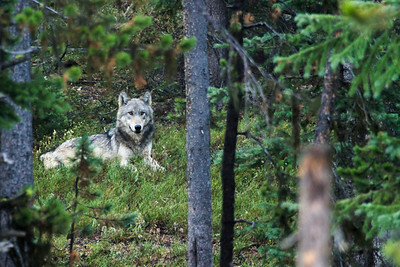 This grey wolf is a member of a pack known as "The Canyon Pack". 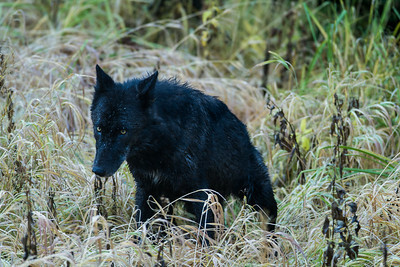 The image was taken shortly after the pack had taken down a cow elk near us. After chasing their prey, they will often lay down or jump into a stream to cool down. 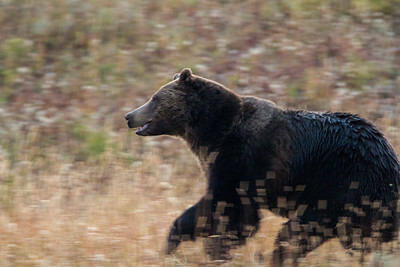 This bear ran past and circled a group of photographers as he made his way to a roadside carcass of a mule dear. Panning with a running animal can be difficult to get a sharp image. This photo was taken in Yellowstone on a early fall morning. 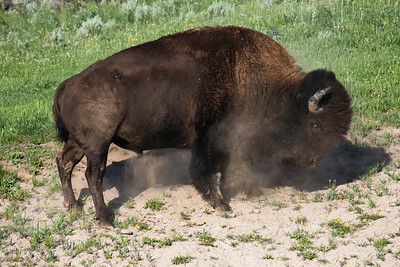 The bison had laid down just for a moment and wallowed, creating some dust. The image reminds Steven of a painting by Robert Bateman entitled "The Chief" which is owned and on display at the National Wildlife Art Museum in Jackson, WY. 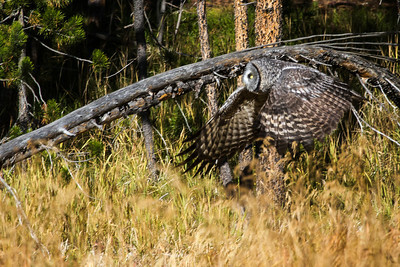 This owl was hunting in a small meadow near Canyon Village in Yellowstone. 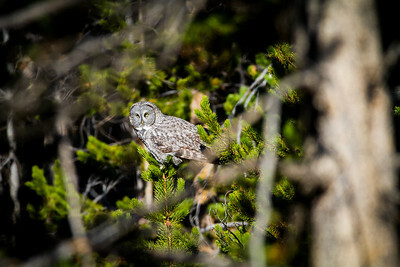 Dori was able to capture this image by observing the behavior of the owl and anticipating when it was going to fly. The Great Grey Owl is one of the few owls that typically hunt during the day, and make for great photographic opportunities. 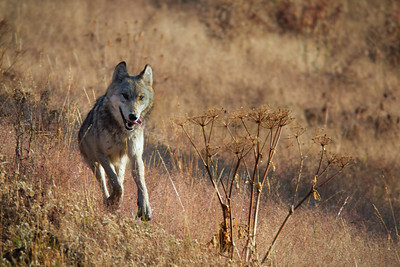 The wolf is coming in to a dinner of elk immediately following a hunt. 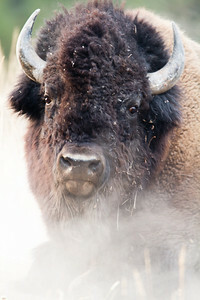 This is believed to be the Alpha male of the Canyon Pack in Yellowstone. 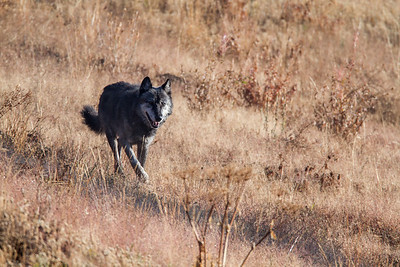 He is coming into a kill made by two of his pack mates. 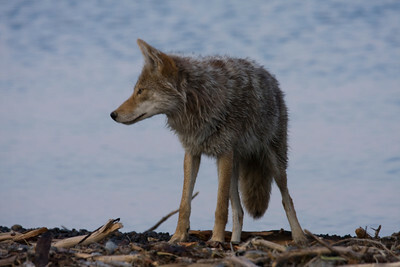 This is a member of the Canyon Pack in Yellowstone. Immediately following the take down of a cow elk, it jumped in a small stream to cool down. Great Greys are beautiful birds. They have such piercing yellow eyes. 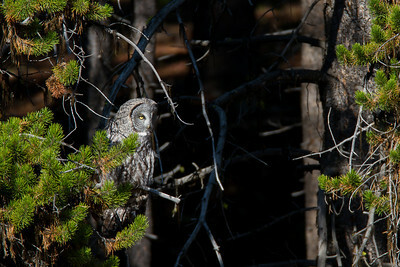 Great Grey Owls are the largest of the owls in North America. Yet look how effortlessly it perches on the top of this small pine tree. Peering through the branches, we catch site of the silent watcher. 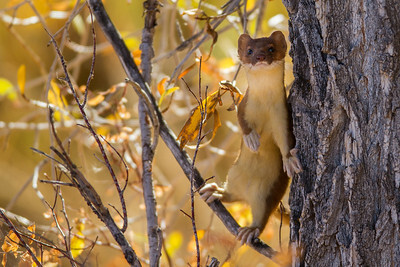 As a wildlife photographer, you often have to take what you can get, even when the branch is in the way. This little critter is fast. He finally stopped for just a few seconds to allow us to take this photo. He was hunting ground squirrels in the area. 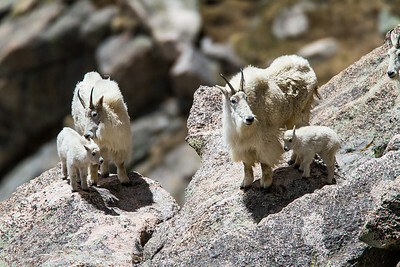 Mountain Goats are very nimble climbers and live up high in the mountains. These are were photographed on Mt. Evans outside of Denver, CO. Although not native to the area, the were introduced into the area in the 1960's and 70's where they have flourished.